If you were to ask me what game companies I associate with quality, Squaresoft would be at the top of my list. Sure, they’ve merged and now go by Square-Enix (Squenix, for short), and perhaps their quality of games has waned a bit since the PS1 days (my opinion…but also fact), but when I was a kid, Squaresoft’s talent rivaled that of the good folks over at Nintendo. I mean, Squaresoft was behind some of my favorite RPGs of all time, like Final Fantasy 9 and Super Mario RPG: Legend of the Seven Stars. The Good: The box/label art is awesome. All in one place you’ve got a pink-haired princess being protected by a knight in golden armor, and a dragon carrying a wizard and some prehistoric-looking child on his back. Not to mention it’s got that old-school anime look going for it so bonus points. The Bad: There’s no direction whatsoever, no motivation to care, random characters, nameless and faceless enemies, an apathetic soundtrack, and to top it all off, the difficulty is brutal. Plus, I’m not even sure this should be classified as action or adventure as the game states. The Glitchy: You lose health by getting hit by enemies, but in a bizarre twist of gameplay mechanics, also by collecting “down arrows” that can somehow litter the screen when you destroy the environment. First Impressions: Well, thing’s started out innocent enough with the title screen. Then all of a sudden I was transported to some forest where my guy was scrolling upwards towards enemies and I had no idea what to do. No intro, no text, and not the slightest hint at what the hell I’m trying to do. It just wasn’t a great start at all, especially for me because I promptly died about 10 seconds in. I’m not one to shy away from difficult games, but this is just brutal. Graphics: Look, it’s an NES game. I can barely remember my time playing TMNT or Mario on the NES as a kid so it’s hard for me to compare it to anything except later generations. 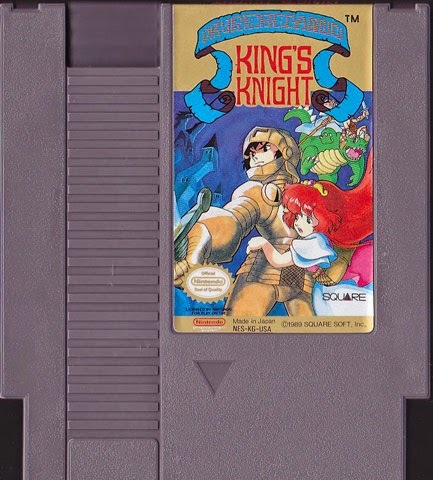 I will say that I recall TMNT and Mario having a bit more detail, even when TMNT when to a top-down look (which is all King’s Knight utilizes). But, the game came out in 1989, before Squaresoft pulled itself from the brink with their Final Fantasy franchise so I’ll give the graphics an…average? Trust me, the cart is more interesting than any game screens. Sound: Not great. There are very basic sound effects for shooting your weapons…or whatever, and for when you destroy things and get hurt. There’s also a little riff going on in the background, but it all seemed just very unaware that there was a game going on. Sure the sounds matched up with their respective events, but if you’re asking me to hum this tune from memory, forget it. Controls: Again, this is an NES game: D-pad for movement in all directions, and use of a single button for firing your weapon. Pretty simple stuff, I guess, and it’s responsive so things are par for the course in this category. Nothing more to see here, move along. Gameplay: It must have been freeing to develop games “back in the day” (in this case, the 80s), because there wasn’t a lot of pressure to fit your game to a formula that had proven successful yet. Sure there were popular games, but there wasn’t that air of “Simpson’s did it!” in the industry. Because there was still so much uncharted territory, companies were free to try new things out. Unfortunately for King’s Knight, this culminated in some odd concepts. First off, you shot projectiles/energy up the screen to destroy parts of the environment and enemies. This wasn’t a foreign concept in 1989, but then again your characters weren’t planes or spaceships – they were people (or in one case, a monster/dinosaur thing…more on that later). It just didn’t fit when a knight or a thief could shoot projectiles. A wizard, sure, but come on Squaresoft – I only have so much reality I can suspend for one game. Second, your character could lose life by being hit by enemies or their weapons, but also from random down-arrows that appeared on screen from destroying things around you like trees or rocks. This is very confusing at first because of the lack of explanation, and I initially thought these arrows controlled the screen’s scroll speed. Needless to say, this is why I died quickly on my first playthough. But the oddest thing is how you’re supposed to “beat” the game. This isn’t anything I figured out on my own because I never even got close: I had to look it up. Apparently you play as 4 warriors tasked with saving a princess or save the world or something. But since they don’t bother to explain this ever, it doesn’t really matter, now does it? You have the knight, the wizard, the monster, and the thief, and each has to collect certain items and then enter a dungeon of sorts to defeat a mini-boss, then at the end each character fights the main boss and things happen. That last sentence is so boring I almost fell asleep writing it, and that’s about how much you’ll care about this in a game that is not only brutally difficult but has given you direction or clue as to what you need to do whatsoever. Plus, when you need to fulfill a series of tasks or events in order to beat a game and there’s no way of you knowing what those are, that game will soon be finding its way to the bottom of a trash can. Story: I gave this away above multiple times, but there’s no way to figure out the story or plot unless you look it up online, or maybe beat the game, which is impossible. Trust me, it’s not worth the effort either way, so just come to terms with that and forget all about this game. 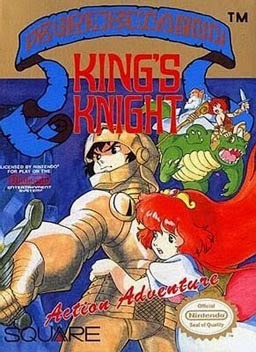 Final Thoughts: <sigh> I really had high hopes for this NES Squaresoft game, but they were for naught. This “action/adventure” romp to kill baddies and save…stuff did nothing but frustrate and confuse me. I guess if there’s one positive thing about this whole experience it’s that I know the great things that Squaresoft eventually went on to do in the gaming industry. We at Graduated Gamer value your feedback and comments (see our comment policy linked at the bottom of the blog). Just remember - have fun and be a decent human being.